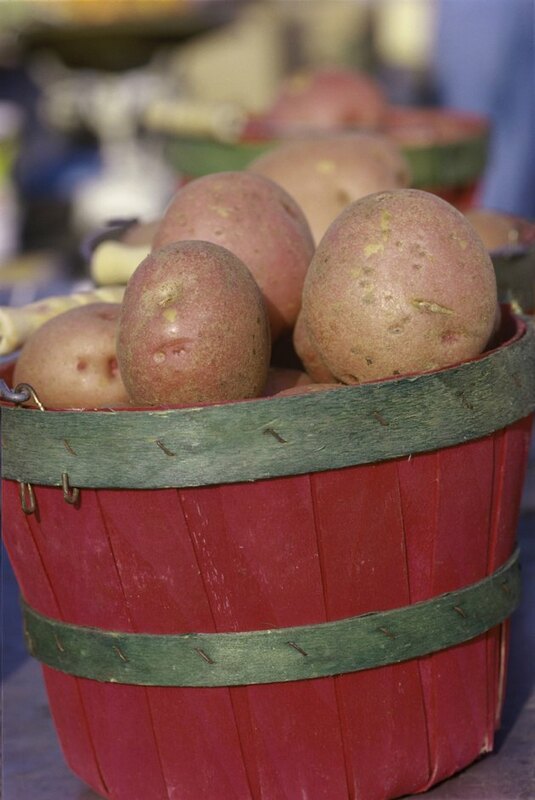 Although you usually think of eating potatoes baked, mashed or French fried, you also can eat them raw. Potatoes have several important vitamins and minerals. However, cooking potatoes can destroy or lessen the nutritional value, so eating potatoes raw gives you the greatest health benefit for your food dollars. You can eat raw potatoes plain or chop them into fresh salads. One large, raw potato provides 72.7 mg of vitamin C, which is 80.7 percent to 96.9 percent of the daily recommended intake; if you are breastfeeding, you require 120 mg. The vitamin C can bolster your immune system and improve the appearance of your skin. Since your body doesn't manufacture this vitamin, eating raw potatoes is a good way to get your daily dose. A large raw potato has a large amount of vitamin B-6, also known as pyridoxine: 0.7 mg. This may not seem like a lot, but it represents 41.1 percent to 46.6 percent of the vitamin B-6 you need each day. Pregnant and breastfeeding women should consume more, and eating raw potatoes is a good option to boost intake. Vitamin B-6 helps your brain manufacture serotonin, a compound necessary to regulate your mood. Include a large, raw potato in your diet to get 3.9 mg of niacin, or vitamin B-3. This is 24.3 percent to 27.8 percent of the quantity you need each day. This vitamin helps maintain good cholesterol levels. However, be careful not to get too much niacin; an excess can trigger skin flushing, upset stomach and blurred vision. Eat a raw potato to boost the thiamin in your diet; each large potato provides 16.6 percent to 18.1 percent of the daily suggested intake of this vitamin. Thiamin, also known as vitamin B-1, is critical for metabolizing the carbohydrates in the foods you eat. Eating raw potatoes also can be a good option when you are weaning yourself from alcohol abuse. A study published in the May 2011 issue of the journal "Nature Reviews. Neurology" indicates that getting adequate amounts of thiamin can help prevent some neurological disorders associated with alcohol withdrawal.